A fatal blow to Christianity ? This article about an Artificial Mind caught my eye. It touches on a core theological tenant of Christianity, namely the makeup of the human being or anthropology. With the advance of scientific discovery over the centuries more and more people have discarded Christianity and the Bible as a viable source of truth and have instead placed them alongside other legends, mythologies and religions. I believe this is a mistake. I would assert that the world of modern discovery and technology has not made it necessary to discard the Bible. There are challenges, yes, but I have not yet found them to be insurmountable. What event or discovery would it take to shake your belief in the Bible? Life on other planets? This would be a monumental discovery but for me it wouldn’t necessarily disprove Christianity (this reminds me of a Larry Norman song). How about proof that Jesus was not raised from the dead? Yes, this would be troubling indeed. Even the Apostle Paul would have given up if that were the case. Another topic which is central to Christian teaching is the dualistic makeup of the human being. On one side there is the physical body and on the other side the metaphysical, soul, spirit. And then there are things which are difficult to categorize like the mind. If it could be shown that these dualistic and quasi dualistic views are false and that in reality a materialistic view is true, namely everything can be explained by the interaction of the neurons, then this for me would pose a serious blow to Christianity if not a fatal one. If all the talk of spirit, soul and mind is simply an attempt to explain something which is so complex that it is otherwise not understandable, then it follows that all the metaphysical claims of the Bible should also be discarded as mythical products of human imagination. 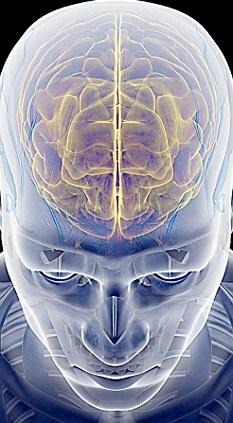 The article reports on efforts to create an artificial mind. Not just a computer but a mind. It should have the ability to go beyond computing and actually think. Here is an excerpt. This is a question that has troubled scientists and philosophers for centuries. The traditional answer was to assume that some sort of ‘soul’ pervades the brain, a mysterious ‘ghost in the machine’ which gives rise to the feeling of self and consciousness. If this is the case, then computers, being machines not flesh and blood, will never think. We will never be able to build a robot that will feel pain or get angry, and the Blue Brain project will fail. But very few scientists still subscribe to this traditional ‘dualist’ view – ‘dualist’ because it assumes ‘mind’ and ‘matter’ are two separate things. Instead, most neuroscientists believe that our feelings of self-awareness, pain, love and so on are simply the result of the countless billions of electrical and chemical impulses that flit between its equally countless billions of neurons. So if you build something that works exactly like a brain, consciousness, at least in theory, will follow. Will they succeed? Personally, I’m not to worried. They have big ambitions and have allocated themselves a convenient timespan of ten years but the implications of this are staggering, so I will be keeping my eyes open. A post about a post about a post. A funny take poking fun at popular theologians writings. The original Post from Eugene Cho can be read here. Be sure to check out the whole list. Lately I have been listening quite a bit to Ancient Faith Radio. I know this makes me uncool, but I’m less concerned about being cool than having somthing help me keep in tune with God. They play music interspersed with readings from the Church Fathers among others. Today they had a few readings from St. Theophan the Recluse and one of them really impressed me becasue it spoke directly to some things I’ve been struggling with lately as if he was reading my mind. You write that you are having trouble controlling your thoughts; they scatter easily, and praying does not proceed as you wish; and that, in the midst of the day, in the midst of toil and association with others, there is little remembrance of God. Instantaneous prayer life is impossible. You must make a strong effort to control your thoughts, at least to some degree. Prayer does not come about as you expect—by just wishing for it, and, suddenly, there it is. This does not happen. There is a widely-accepted misconception among us that when one becomes involved in work at home or in business, immediately one steps out of the godly realm and away from God-pleasing activities. From this idea, it follows that once the desire to strive toward God germinates, and talk turns toward the spiritual life, then the idea inevitably surfaces: one must run from society, from the home—to the wilderness, to the forest. Both premises are erroneous! Homes and communities depend on concerns of daily life and society. These concerns are God-appointed obligations; fulfilling them is not a step toward the ungodly, but is a walking in the way of the Lord.